Below you will find some stories that we can all learn from and make better decisions how we handle these types of situations. I was leaving a mall in Gainesville, Florida when two gentlemen approached me and asked me how to read the bus schedule. As I bent over to help them find the appropriate bus, I felt one of the fellows brush my back pocket where my wallet was located. I quickly adjusted my pants in a casual manner to find that the man had failed at his attempt. Placing my hand on the small of his back, I gestured him closer to the bus schedule. When the man made a second attempt at my wallet, I stopped him cold with his hand in the cookie jar. I told him that before he should try a move like lifting a wallet, he might want to know what he is doing first. At that time I handed him his own wallet which I had lifted after he blew his first attempt at mine. I also told him to choose his victims more wisely, but somehow I feel that his pick pocketing days are done. A friend of mine was riding a subway when a stranger struck up a conversation with her he seemed nice enough and was sitting opposite her and was not intruding her personal space… so what harm could it do? Well, they went through a tunnel and it got dark really quick. He got off at the next stop. She then realized her ears were a little sore and her earrings were gone!! Weird huh?? Now that’s cunning! Good luck with all your endeavors. I had just returned from three weeks in Mexico, including some areas where pick pocketing occurs frequently, but as I had taken precautions, I was never a victim. On my way home I stopped over in Vancouver BC to visit a friend for several days. On the first night I went to a neighborhood convenience store only to find my wallet gone when I got back to my friend’s home. I recalled being bumped by an apologetic young woman just after I had paid for my purchase, so I immediately jumped in the car and returned to the convenience store, where there was no sign of her. So I began driving about the neighborhood and spotted her hurrying down a side street. I stopped the car and before I could say a thing, her eyes widened and she exclaimed, “I don’t have it!” Bingo. I knew I had the right person. I told her that I would hold her for the police and charge her if I did not get my wallet back. She could keep the $40 or so that was in it, but I wanted the wallet (with debit and credit cards and about $800 in travelers checks) back. She then showed me where she had thrown the wallet beneath a dumpster and I recovered it. Cheap payment for its return and for an education, I thought. My wife and I were at a Paris Metro station where the loudspeakers were blaring “WARNING. THERE ARE PICKPOCKETS PRESENT AT THIS STATION”. We got on the crowded subway. A woman stayed half on and half off, blocking the door. At the same time, another woman was bumping against me, indicating that she needed to get off. She got past me and she and her friend exited the train, allowing the door to close. As she did, I realized that my cash (about $120) was gone from my pocket. As we pulled away, I watched the two women at the station, smiling and waving at me. I never thought this could happen. First time I did not pin my money in my dungaree pocket. Why not?? I don’t know. I had 234 cash and 1200 in traveler’s checks in a little wallet in my fanny pack in front. I got on bus 103 and when I got off, the money and traveler’s checks were gone but my license, visa and bankcard were in my wallet. They only took money and traveler’s checks. Don’t know how they did this. Thankfully, I got my traveler’s checks replaced, no problem, within 2 hours. I was going on the Trans Siberian train via Moscow. I was on the bus with my wife and in rushed a kind of gang — pushing us inward. I felt bumps on my behind and many touches on my shirt pocket. I knew this meant one thing but I kind of felt drowsy and was out of control. When suddenly, a man rushed past me but even then it took some moments for me to wake up. We got out after the man and he gave me permission to search him.? Finding two wallets, but not mine, told me he was in the gang. Is it possible those guys have some kind of spray form of drug that makes you kind of out of this world? They got what they wanted from me and later we found out that they had cut up my wife’s bag but not as lucky there. I would like to hear from some one that thinks he has been drugged in this fashion. I had been out with friends for dinner and a few drinks and had noticed these three guys doing a poor job of looking inconspicuous while watching us in the bar. We were making no attempt to hide our wallets, money, or possessions and this must have gotten their attention. We wandered out to the outside patio of this restaurant when one of the trio approached me asking for a light for his cigarette. His buddy, acting drunk, stumbled into my friend and, in the act of catching himself against my buddy, got hold of his wallet. He then stumbled my way but miraculously regained his balance as I drew my Glock eye-level to him. I held them for the police, and they were the winners of a free extended stay at the Grey Bar Inn in beautiful downtown San Antonio, TX. They were found with twenty-six wallets altogether. I was in London, riding on the Tube (subway). Having been warned about pickpockets, I was carrying my wallet securely in an inside breast pocket. However, wadded in the right rear pocket of my jeans was a bandanna. Since I was fighting a particularly nasty cold, the bandanna was well used, even saturated. Due to the wadding, the pocket was conspicuously bulging. As I am standing, hanging onto a strap, someone bumps me from behind in passing. On the heels of the bump comes the faintest sensation of fingers whisking through the rear pocket. It took me a second to put two-and-two together, but as I turned I saw a guy just exiting the door to the next car while wiping his fingers on his trouser leg. A pretty unsatisfying attempt for the thief, I’d say. 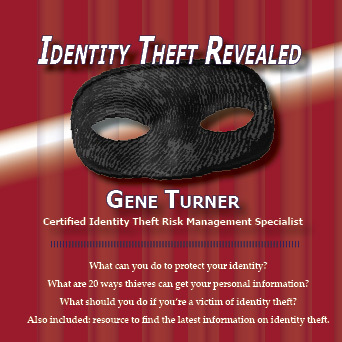 Gene Turner is Corporate Speaker, Trainer & Infotainer. For more than 30 years, Gene Turner has thrilled, mesmerized and thoroughly entertained audiences with his unique blend of magic, humor, and outrageous pickpocket exploits. Gene Turner is a national speaker and entertainer based out of the Greater Kansas City area. Wonder what Gene has been doing lately? Check out his Facebook feed to find out.